Now THAT’s how you start a week! 15 Responses to Now THAT’s how you start a week! When do we vote on the items to be added to HM3? Danny, I said it before — it’ll happen when it happens. Chill out. I don’t know when I’ll compile the results into a poll, but it’s not exactly an urgent priority. I’m still backed up on actual claimed prizes. Ha, this is what I say every Monday. Actually I am about to tear down a set today so this caption is very apropos. If only MY week started this way! I wouldn’t be surprised if that was how he ACTUALLY started his day. That could easily just be him jumping out of bed. I wouldn’t put it past him. Nick (4): What about it do you need to figure out? I might be able to help, or might not, seeing as I’ve never actually tried to do it so don’t know everything. I think it’s pretty obvious at this point that Samson is an existentialist. To Samson, architecture represents the artificial and arbitrary constraints imposed on the individual by a repressive society. Smashing them sybolizes the power of the human spirit to triumph over the soul-numbing forces of conformity. @Nick Hentschel(4) and Kaylin88100(5): If you are serious about contributing Custom Items check out Jeff’s blog post in the HeroMachine 3 section. Essentially you need to provide Jeff with vector-based artwork (Illustrator EPS or Flash) with everything organized into the three shapes/colors (Line Art, Color 1, and Color 2) that are used for all of the art assets in Hero Machine 3. I am currently creating one Custom Item (95% guaranteed, thank you GENCON!) every week for Hero Machine chosen by the forum dwellers in weekly polls. I throw in other items at my whim, but I’m committed to at least 1 new item a week. If the item is acceptable Jeff adds it to the program when he has the time. So join the fun. IF YOU DARE!!! Wow, Sutter, that’s deep! 🙂 Only, if he were really an existentialist, wouldn’t he also despair over the futility and absurdity of life in a meaningless universe? Would he chain smoke like Sartre or end up driving his car into a tree like Camus? 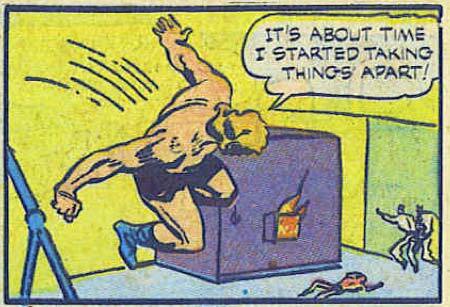 Is Samson the new Bulletman? All profound questions to ponder. when did he ever stop? Samson is such a grump without his morning coffee! Bulletman, I miss you, you weren’t a rampaging sociopathic murderer like Samson. Niall Mor – Camus was actually an absurdist but you’re right. Samson is an absurdist, not an existentialist. Like Camus, he believes life is fleeting and it is therefore important to appreciate the things one enjoys while one can. In Samson’s case, that happens to be demolishing buildings with his bare hands. Because taking apart a lit furnace seemed like a good idea at the time. At least he can take the bad guys with him.